Cooking Showdown: Gas vs Electric - Which Should You Choose? 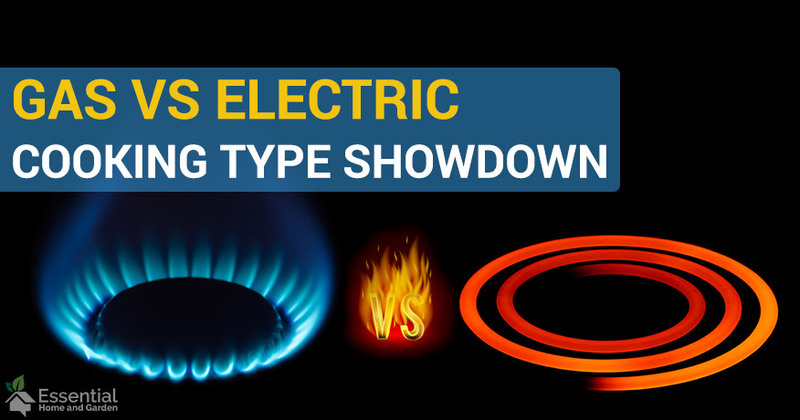 Cooking Showdown: Gas vs Electric – Which Should You Choose? Your kitchen is something that you’ll be using practically daily for a long time, so investing in the right appliances is important. Of the appliances in a kitchen, your oven and stove are likely to experience the most use and will play a sizable role in your overall cooking experience. But the choice is always there – gas vs electric. So how do you choose the right one when it comes to cooking? You may be surprised at how much goes into choosing a stove and oven setup outside of going stainless steel or going with a colored finish. You’ll want to make sure it’s big enough to cook the entirety of Thanksgiving dinner without drying out the turkey or making the stuffing mushy. In many cases, you’ll be picking out a range (stove and oven combination) for your kitchen and will have to decide between 2 fuel sources for both units: electric and gas. Each has their benefits when it comes to either the stove or oven, and there are even hybrid options that allow you to do both! Below we’ll go over the pros and cons of gas and electric stoves & ovens to help you decide if you can choose a single style or need a hybrid to fit your cooking needs. 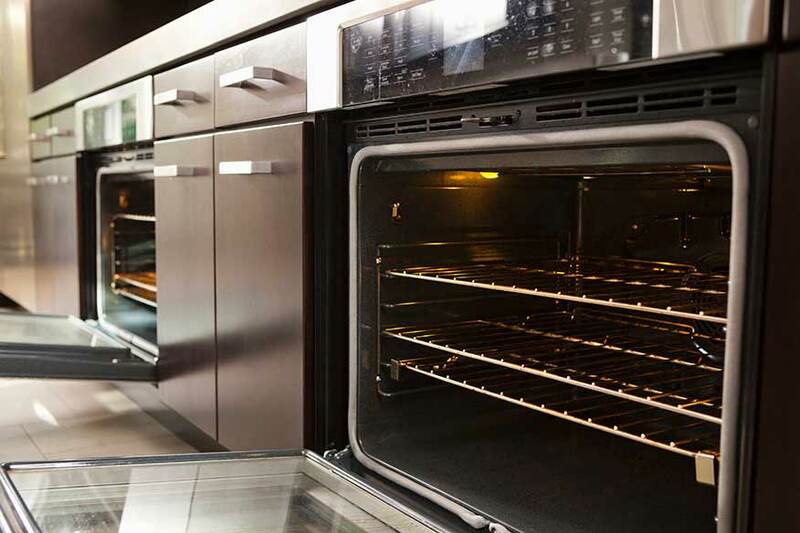 When it comes to baking anything from a lasagna to cookies, your oven is the go-to appliance. They are often attached to a stove top as part of a range, with gas (from a gas line), electricity (from an outlet), or both options for fuel (hybrids/dual-fuel). Whether it uses a flame for heat or an electric coil, the oven can be set to a high temperature to cook a wide variety of dishes and treats. However, each fuel type makes a difference in the cooking experience, so you’ll want to know what to look for when shopping. 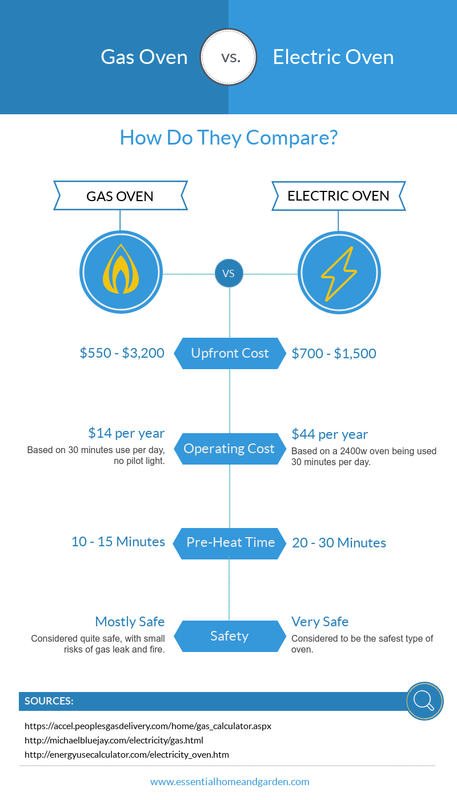 There are actually 2 costs associated with each type of oven: initial costs and operating costs. Initially, an electric model will be cheaper than a gas oven. This is because a gas oven requires a gas line to function, and the installation of the model includes hooking it up with the help of an expert. It becomes even more expensive if you don’t currently have a gas line installed. However, the cost to use the ovens over time will vary based on the price of gas versus electricity. In general, gas as a heating source is about 3-4 times cheaper than electricity (greenage.co.uk), helping to make up for the cost difference over time. Gas ovens are much more expensive to purchase and install. To get the oven up to temperature, an electric oven will heat the coil inside to distribute heat throughout the oven. This involves going from a cold coil to a superheated coil before it can give off sufficient heat, making it slightly slower to get up to temperature. However, once the flame is lit on a gas oven the heat begins instantly and can be easily adjusted based on the size of the flame, allowing for faster cook times and higher temperatures. Alternatively, an electric coil will hold its heat for longer between cooking. This allows you to start and restart cooking more effectively with an electric coil despite a slower initial heat-up. Gas ovens reach cooking temperature much faster than electric ovens. Perhaps the most overlooked aspect of choosing between an electric vs gas oven is that they provide different types of heat, providing a different cooking experience for your food. The benefit of gas ovens is that they provide a moister heat, helping to prevent roasts and certain dishes from drying out when heated. Alternatively, electric oven cooking gives you a drier baking experience that makes it great for adding crisp or crunch to your foods, perfect for crispy cookies or french fries. Gas ovens provide a more moist and humid heat. While chances are that you won’t be moving your gas or electric range too often, in the case that something comes detached or it gets moved, you’re going to be safer with an electric model. Electric models can be placed anywhere and simply need an outlet to work, while gas ranges need to be connected securely to a gas line. This means that if there is a power outage, your electric oven won’t work but your gas oven still will. For those who experience rolling blackouts or natural storms that cause power outages, a gas stove may prove superior. 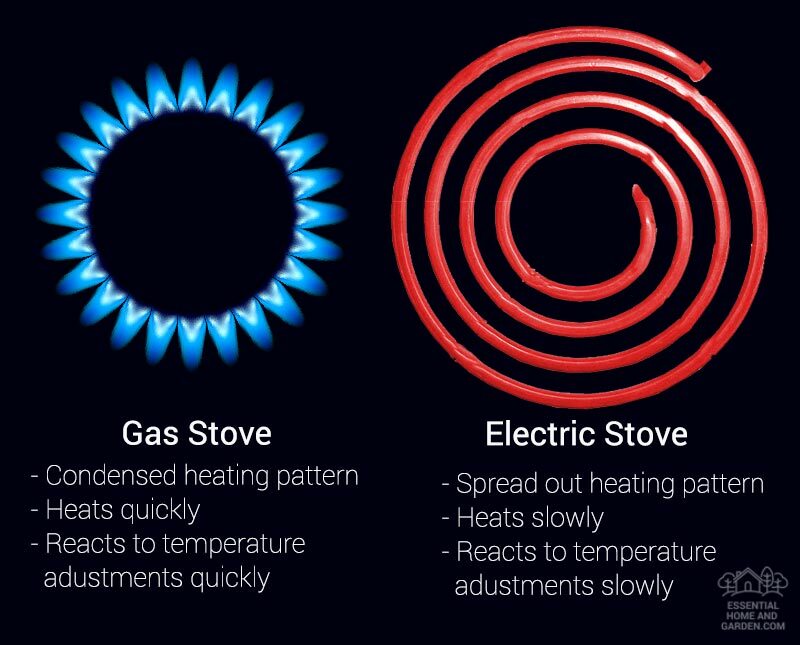 A gas stove will work in a power outage, an electric stove will not. When you’re working with any type of fire or heat, there are always dangers. This is especially true for gas ovens that require a gas line to operate. If there is any separation or leak from the line, you risk inhaling fumes or even worse – igniting your kitchen. With an electric oven, only electrical failure and burns pose a threat making them safer in many cases. An electrical oven is considered the safer option. Overall, it’s hard to crown a definitive winner between electric or gas ovens. If you’re looking for a cheap and easy option, an electric model will be a solid choice (getting more expensive over time, however). If you want to spend a little more now to save later and have a gas line already, the extra cost of a gas model may pay for itself. Depending on your budget and cooking plans, it’s hard to go wrong with either option. If you can’t decide on a type, a hybrid model that boasts gas and electricity for a heat source will certainly give you the freedom to cook anything. While you may not even know what kind of oven you’re using, you definitely know the type of stove! Unlike an oven, the stove’s heat source is exposed and visible to the user. If you see a flame, you’re working with a gas stove. If you see red-hot coils or a flat surface glowing red, it’s electric. Like ovens, choosing between an electric vs gas stove primarily comes down to the user’s preferences and budget. There are pros and cons for each, so consider them before making your choice. 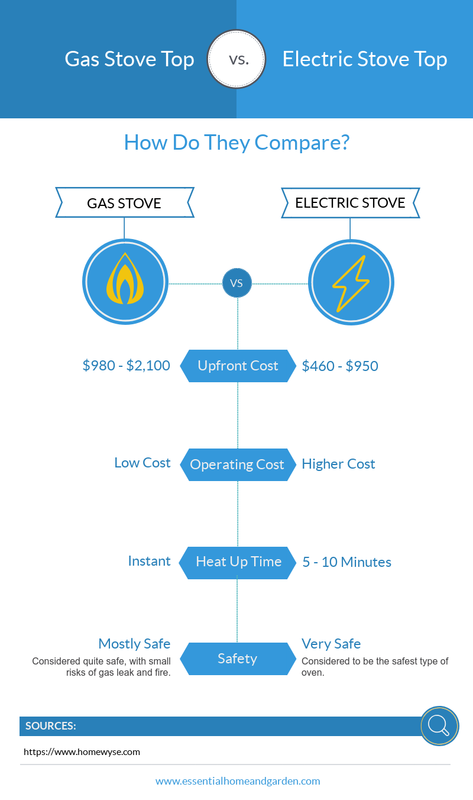 You will likely be buying your stove and oven at the same time in the form of a range, so it’s no surprise that an electric stove will cost less than a gas model like its oven counterpart. The initial cost of buying a gas stove and oven will likely be higher, but if you have a gas line you can save enough to make up for the difference as time goes on. 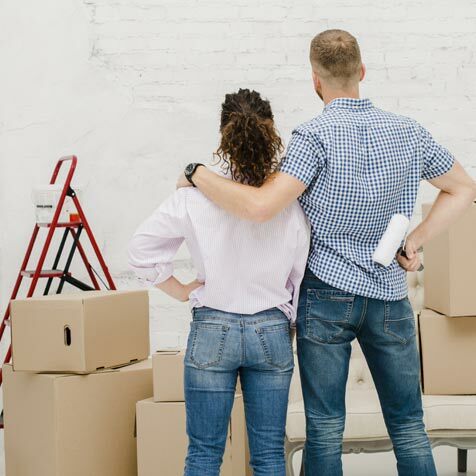 However, if you lack the natural gas connection you’re looking at much more of an investment. Gas stove stops are more expensive to install than the electric type. Unlike ovens, there is less difference between the heating time of electric and gas stoves due to how the food cooks. In an oven, the entirety of the interior is being heated and cooking the food. However, with stoves there is a direct heat source that is applying heat to the dish from the burner. This direct heat transfer allows for more efficiency, so you want options that make contact with the pot for the best efficiency. With a gas model, the pots and dishes are heated indirectly by the heat rising from the flame, losing some of the efficiency. A coil will take longer to heat up initially but will have comparable heat transfer once it reaches the desired temperature because it directly touches the pot or pan. This is also true with the flat-top electric stoves, as they directly heat the burner’s coil that is below the dish with slightly less efficiency due to the small layer on top of it. Gas cooktops apply heat instantly, whereas electric cooktops take some time to reach the desired temperature. As we know, direct access to the heat source is a good way to heat quickly. However, in order to heat effectively and distribute that heat for even cooking, you want more room for heat transfer. When cooking with a gas burner, the heat from the flame heats both the bottom of the pan and the sides for a more even dispersal. When you heat with an electric stove, you are applying direct and more intense heat to the coil locations, with other “cold spots” getting less direct heat. This can lead to a less consistent cook. 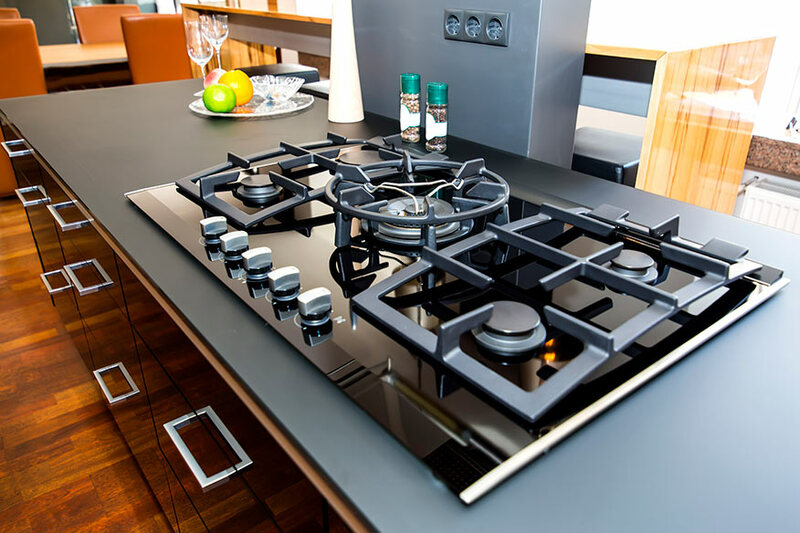 Gas cooktops generally provide a more even heating pattern. Perhaps the single greatest benefit of an electric stove vs a gas stove is the cleaning convenience. With flat-top models, you can simply wipe down the entirety with a rag (waiting until it’s totally cooled down!) to clean it. However, a gas burner has grates that need to be removed and cleaned separately making it much more difficult to wipe down messes. Electric stoves can also go anywhere without being restricted by a gas line, making them more versatile options. However, they will be inoperable without power so have a backup plan (like a hybrid range) in case of an outage. Another significant benefit of electric cooking is the absence of highly flammable and dangerous gas. Gas lines can leak, and gas burners can be left on, filling the room with gas that you risk inhaling. The open flame also makes it easier for you to set something else on fire accidentally. Electric models are dangerous in their own regard when it comes to looks. In many cases, you’ll find that an electric stove stays hot for longer than gas stoves because the heating element is inside the burner and exposed. They will likely glow red or orange when scalding hot, but they can still be deceptively hot when they look perfectly normal, making it dangerous to touch without testing the temperature first. Electric stovetops are considered to be the safer option. When it comes to cooking on gas or electric stoves, not all cookware is created equal. Each stove type behaves differently and a gas stove requires different properties out of your cookware than an electric stove. You can find our guide on cookware for gas stoves here. For cookware recommendations for an electric stove, you can view this guide. For gas vs electric stoves, the verdict definitely leans more towards electric (particularly flat-top) electric models. They are cheaper and safer than gas, heat up in similar time, and are much easier to clean. However, as long as you are mindful of potential gas leaks and safe usage, you can be perfectly fine using a gas stove. It comes down to personal preference as well as the options for a complete range that are available to you. Overall, the ideal decision between gas or electric ranges will vary on a few factors. Gas models will cost more upfront but less over time, and electric models are cheap and convenient to use. However, both options are likely more than capable of meeting your cooking needs without too much of a difference. If you can’t decide on a type of oven, check out the differences when it comes to stoves (or vice versa). Many ranges are single-fuel source, so if you want an electric oven for your baking you’ll end up enjoying an electric stove as well. Alternatively, if you want the ultimate flexibility (and are willing to pay for it), a dual-fuel range can get you the best of both worlds. Thank you for writing this! I have been frustrated with pan searing and frying meat to desired cooking because my electric stove, I feel, doesn’t give me the heat changes I need to pull it off. I follow recipes that say “2-3 minutes on each side” and I have to do 5 on each side and it’s still not cooked enough. Plus there’s electrical wiring issues that don’t allow me to run the microwave, the coffee maker, and the stove at the same time. Hands down I prefer gas for many reasons including the ones listed on this article. But additionally, if you’re passionate about cooking, an electric stove doesn’t give you the freedom to cook more complex or heat sensitive meals. Hi Diana. I am glad that you found our article helpful and thank you for the kind words! Be sure to share it with your friends! 6 years ago I switched to an Induction Range……I am absolutely sold on them….glass top, easy to clean when my wife cooks, seldom thank god…Power boil option is super fast…. I have done most of the cooking for the last 30 plus years…. Hey Doug, they certainly have a lot of benefits when looking at them on paper. I have only tried them once or twice myself so far – thanks for the feedback!